KANSAS CITY, Kansas — A jury found two former Schlitterbahn Waterpark employees not guilty of lying to investigators in the 2016 death of a 10-year-old boy on the Verruckt water slide. 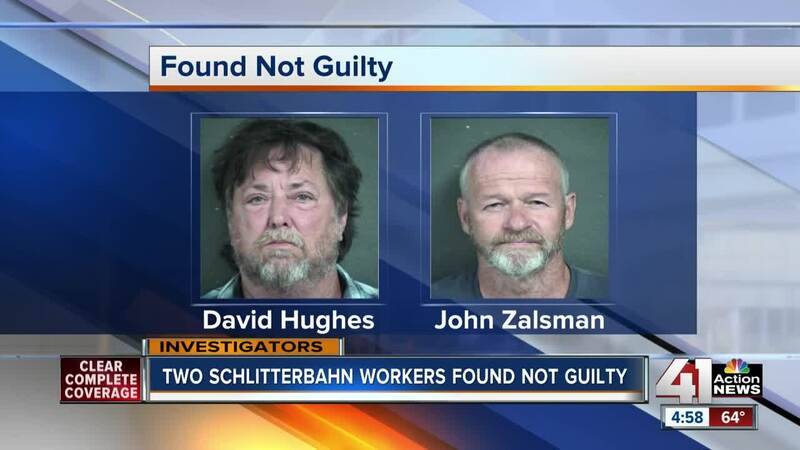 The case against David Hughes and John Zalsman was the first one involving current and former Schlitterbahn employees after the investigation into Caleb Schwab's death. Schwab died from a neck injury while on the slide. A Schlitterbahn spokeswoman released this statement after the verdict: "We have maintained our belief in the integrity of our staff and respect the process and decision by the jury." Hughes and Zalsman were accused of interference with law enforcement by false reporting. On Thursday morning ahead of the verdict, the jury came back from deliberating to ask about one of the instructions in the case. The question related to an issue raised by Hughes' attorney, Scott Toth, who claimed the case should never have been brought against his client in Wyandotte County. However, the jury instructions that Judge Robert Burns agreed to were to consider what crime had been committed in Wyandotte County. Kansas Assistant Attorney General Adam Zentner said in his closing arguments that the investigation centers on the Verruckt water slide brake mat, which is in Wyandotte County, so it shouldn't matter where Hughes was interviewed. KBI detectives interviewed both Hughes and Zalsman in June 2017. Both men told investigators that a brake mat in question was only on the water slide during testing, not when the park was open to the public. But a YouTube video taken by a waterpark guest showed the mat was there not long before Caleb Schwab died on the slide in August 2016. On Wednesday, Schlitterbahn lifeguard Jenson Connor testified that she saw the loose mat , took it off and reported it to managers. But the mat was never repaired. In his closing argument, Zentner played part of the audio recordings of the KBI interviews with both Hughes and Zalsman. “They're not confused, there's no memory issues,” Zentner told the jury. Zentner argued both men knowingly told false information to investigators with the intent to mislead them. Toth also said the KBI had evidence, including the YouTube video and a screenshot from the video showing the mat in place during the season, but did not show that information to either Hughes or Zalsman. KBI investigators did show that evidence to a third man on the maintenance crew, Willard Kampmeier, Toth said. He also noted there had been multiple configurations of the brake mats on the slide over the course of its operation. Attorney Christopher Joseph, who represents Zalsman, said in his closing that there was no evidence presented during the trial to show the brake mat even mattered or was a factor in Caleb’s death. "Why would two working-class, hourly guys lie about something insignificant. It doesn't make sense," Joseph said. Zentner, however, said both men were shown photos and given an opportunity to change their recollections, but did not. Zentner noted both men told KBI investigators that they were responsible for the maintenance of the Verruckt. Hughes told investigators he knew the slide "inside and out,” Zentner said. This case is the first one involving current and former Schlitterbahn employees after the investigation into Caleb’s death. Park co-owner Jeff Henry, Verruckt designer John Schooley and former manager Tyler Miles all face multiple charges related to the death of the boy.